Rio de Janeiro, Brazil on July 24th, 2016. 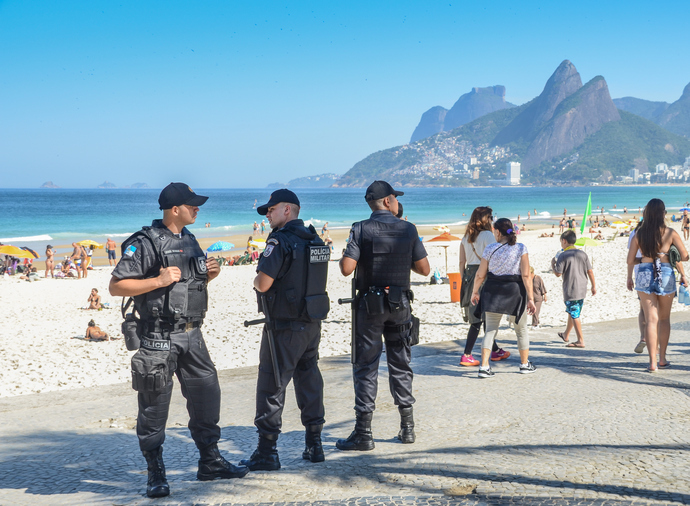 Brazilian military police watch over tourists and locals at Ipanema Beach in Rio de Janeiro, before the start of the Summer Olympic Games in August 2016. Brazil is one of the most dangerous countries in the world. Statistics show this easily and people feel it on the streets, mainly in the big cities, such as São Paulo, Rio de Janeiro and Curitiba. Every year there are around 60,000 murders, some of them carried out with shocking ruthlessness. Despite this insecurity, felt for decades now, a terrorist attack has never occurred. In fact, Brazil has not even seen an attempt or a failed plot. There has been just one case of a jihadist group sentenced to prison – the Hashtag Operation group, just days before the Olympic Games in 2016. It is covered later in this article. Briefly, as terror cases go, it was not among the most serious. That said, the Brasilia prosecutor is concerned about terrorist propaganda reaching young Muslims, including converts. But he notes that it is hard for the Polícia Federal or even the ABIN (Brazilian Secret Services) to estimate how many people are listening to and promoting the words of radical Islam. It is also not clear how many of them want to travel to the Middle East or Africa to join ISIS and its affiliates. “Not so many”, he surmises. “We have to be aware of this complex problem, but Brazil doesn’t have to deal with this matter with the urgency of other countries.” Countries such as France, the United Kingdom, Belgium, or Germany, just to mention Western examples. Concern was quite high, though, when the Olympics were staged in Brazil in 2016. Some months before the games, the FBI alerted the Rio authorities about suspicious internet and social media activities in Brazil. The suspects were passing their days chatting about weapons, ISIS, and the best ways to carry out attacks in Brazil during the games. In the same period, the SITE Intelligence Group, which has expertise in monitoring jihadi activities on the internet, noticed that a small group of Brazilians citizens had sworn loyalty to Abu Bakr al-Baghdadi, the ISIS leader, and that the terrorist organization had created a Telegram communication channel in the Portuguese language. The backdrop was part of the alarm – terrorist attacks were continuing around the world. As the reports came into Brazil, Nice was attacked on 14 July. A lone wolf drove a truck through crowds of innocent people on the Promenade des Anglais, killing 84. In Rio, the authorities feared just this type of attack. The Olympics would attract huge numbers of tourists to the city and one crazy man with radical inspiration could kill many more than the Nice attacker. Suddenly, Brazil was on the terrorist map and there was no time to waste. Action followed in July. In the “Hashtag Operation”,12 suspects were arrested in the first and until today only major counter-terrorism operation in Brazil. The arrests were based on the suspicion of promoting terrorism on social media, a new kind of crime under the umbrella of the new terrorism law. The impact of the Hashtag Operation was huge, both inside and outside the country. People from all over the world were watching the games. They saw that Brazil was working to catch the “bad guys”, but a dark cloud called ISIS overshadowed the games. However, apart from fundamentalist propaganda, not much was found. Apparently none of the suspects were caught with weapons, explosives or chemical products. All of them lived in Brazil and they only knew about Syrian training camps through the internet. Immediately, some critics said that the operation was a flop and that the authorities had created unnecessary fear in the population, just 15 days before the Games. Could the group be no real threat? Perhaps it was only a bunch of lunatics with poisonous ideas, yes, but ultimately just harmless amateurs? The suspects came from ten different Brazilian states and did not know each other in the real world. They only met on the internet – Telegram, WhatsApp and Facebook were the tools of the self-styled “Soldiers of Allah”. According to the police, however, they were trying to arrange a physical meeting and the police operation may have prevented it. The judge in the case, Marcos Josegrei da Silva of the Federal Court of Curitiba, noted that the defendants were indeed “promoting terrorism”. They all tried to “spread, foment, encourage, push, boost, instigate or motivate a terrorist organization”. El Kadre in particular repeatedly insisted on forming a jihadist cell in the state of Mato Grosso with one mission – committing a terrorist attack on Brazilian soil during the Olympics. The targets could be foreign tourists, gays or Jewish people. It was a historic verdict. For the first time, Brazil had jihadi inmates, convicted under the new anti-terrorism law passed four months before the Olympics and inspired by other laws approved all over the world, mainly after the Paris attacks in 2015. The terrorism hysteria, did claim one victim – Valdir Pereira da Rocha, the 36 year-old younger brother of the mastermind Leonid El Kadre de Melo. Valdir too was arrested in Hashtag Operation. A few days later, a judge released him after the ongoing investigation concluded that he had no connections to the terrorism offenses. However, Valdir was left with two problems. First, his picture and name featured in the news coverage. Second, he was taken back to prison in connection with an older murder case. Weeks later he was found dead at Várzea Grande Penitentiary in Mato Grosso. Inmates linked to Comando Vermelho, a criminal group with dozens of homicides all over the country to its name, beat him with iron bars after blocking the CCTV cameras with mattresses. The government has not recognized the two phenomena, but the authorities have investigated them since 2000. Local newspapers have discovered some information that shows the tip of the iceberg. In 2006, the Brazilian police arrested Farouk Abdul Hay Omairi, a Lebanese businessman who had obtained Brazilian citizenship illegally. His two sons were arrested as well. Omairi lived in Foz de Iguaçu, in the south of Brazil, and was suspected of providing travel support to cocaine smugglers. This investigation, called Operation Camel, was one of the first to track links between Hezbollah and drug trafficking in the tri-border area of Brazil, Argentina and Paraguay. According to the US authorities, Mr. Omairi was one of the people financing the Hezbollah network in South America. In recent years, the Brazilian press has reported a deal between some Lebanese prisoners in Brazil and the PCC (Primeiro Comando da Capital), one of the most dangerous and influential criminal groups in South America. It is said that the PCC provides protection for Lebanese inmates. In return, Hezbollah provides weapons and bombs to the PCC, increasing their power. Other sources reveal that Hezbollah is not the only radical Middle Eastern group with obscure activities in the region. Hamas and even al-Qaeda are trying to gain influence too. Furthermore, since the 1990s Iranian radicals have used the region as a hiding place. Moshen Rabbani was one of them. Police suspected he was the brains behind the attack on a Jewish center in Buenos Aires in 1994 that killed almost 100 people. Rabbani ran to Tehran but later he was tracked by Brazilian Intelligence in the tri-border area. But nobody arrested him. The menace of narco-terrorism is also monitored in the north of the country. The authorities have reason to suspect that there could be links between Brazilian crime syndicates and paramilitary guerrillas from Venezuela and Colombia such as FARC (Forças Armadas Revolucionárias da Colômbia). Once again, the drugs and weapons business could damage Brazilian society. One of the most mysterious stories that has put Brazil on the international intelligence radar in recent months has roots in Beirut. Jihad Ahmed Diyab was born in Lebanon and grew up in Syria. He was arrested in Pakistan in 2002 for suspected links to al-Qaeda and sent to the American detention center in Guantanamo. He was held for 12 years but never charged. Now Diyab lives in Uruguay, where he has refugee status. Diyab complains that he is in a limbo situation and does not want to stay in Montevideo. He says that is treated like a criminal and his movements are tracked by the authorities all the time. For its part, the press still speculates about possible connections between Diyab and the Hashtag Operation. Is Diyab looking for family and real freedom in Brazil? Or is he one more jihadist at large in South America? Outside the shadows, it seems no one really knows.